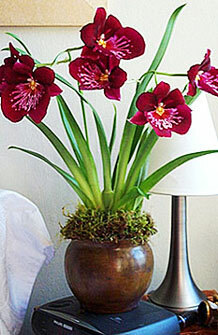 Inviting and irresistible, Miltonia always attract attention. As popular as the Phalaenopsis, the Miltonia we've selected exude an undeniable charm. Tall, slender leaves provide a striking backdrop for this orchid's tender, pansy-like flowers. With blooms that infuse the air with fragrance in the early morning and late afternoon, Miltonia are the perfect addition to your bedside table or bathroom counter. The velvety deep red flowers are approximately 12-15 inches tall and shipped with 5-8 buds, which will bloom for up to 4-5 weeks. The blooms measure 2.5 inches in diameter. Accentuate the beauty of your potted Deep Red Miltonia in an exotic hand-woven basket or the burnished brass pot shown in the picture. Own both of them now and enjoy! For other containers, view BASKET or choose below.